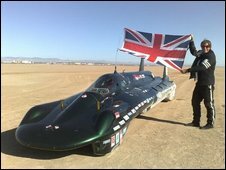 A team of British engineers has broken the longest-standing world land speed record in California. The steam car, Inspiration, recorded an average speed of 139.843mph (225.06km/h) at Edwards air base, in the Mojave Desert, smashing the 1906 record. For the Federation International Automobile record, the Hampshire-based team had to finish two runs in opposite directions, less than an hour apart. American Fred Marriot held the record set in 1906 of 127mph (204km/h). The 25-foot-long, three-tonne "kettle" was driven by its main financier Charles Burnett III from Lymington, Hampshire. 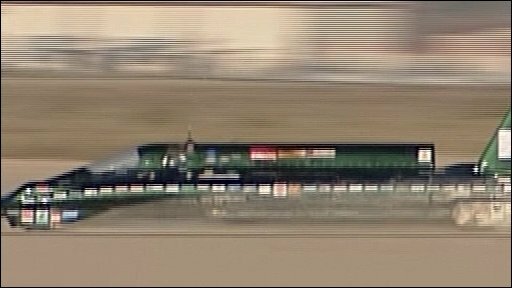 It reaching a peak speed of 136.103mph (219.04km/h) on the first run and 151.085mph (243.15 km/h) on the second. The record was smashed at 0819 local time (1619 BST). Speaking from California, Mr Burnett said: "I wouldn't like to leave it this close again, it was the last but one day we had to do this. "It was absolutely fantastic I enjoyed every moment of it. The car really did handle beautifully. "It is a privilege to be involved with such a talented crew, what we have achieved today is a true testament to British engineering, good teamwork and perseverance." The team only had until Wednesday to attempt the record before they were due to return home. Its first attempt was dashed when the car's turbine became stuck on Wednesday, 19 August. The car will be brought back to England and will end up at the National Motor Museum in Beaulieu, Hampshire. It is made from a mixture of lightweight carbon-fibre composite and aluminium wrapped around a steel space frame chassis and fitted with 12 boilers containing nearly two miles of tubing.